GeekVape Aegis Review: Does This TC Mod Stand up to Its Name? Geekvape is a company well known for their atomizers such as the Geekvape Griffin, Ammit, Tsunami and more. They’ve recently ventured into releasing mods such as the Karma Mechanical Mod and recently the Tsunami Pro Mech Mod Kit. Now, they’ve released one of their first box mods, and this one was designed by their GM, Justin. Unlike a lot of the other box mods on the market, this device features a rugged design and is waterproof and shockproof! Before getting any further into this review, we’d like to thank 3avape for sending this product to us for the purposes of this review. I will go over my first impressions, usage, performance, pros and cons, and conclude with whether I recommend the new Geekvape Aegis 100w TC Box Mod! When first receiving the Geekvape Aegis 100w TC Box Mod, I immediately noticed the solid packaging. This device is a bit different in comparison to other Geekvape devices and atomizers, which is certainly a nice change. On the front of the packaging, you see the branding and on the back, there’s some information. Once you slide open the packaging, you’re immediately greeted with the device. Included with the Aegis, you do receive the mod itself, a 18650 battery adapter, instruction manual, spare silicone film, spare screws and a micro USB cable. This device does require a single high drain 26650 battery for operation, but you can utilize the 18650 adapter if you prefer to use those type of batteries instead. I do want to mention right away that the micro USB port for this device is at the top of the vape mod, and it is concealed. Simply unscrew the silicon and you can access the micro USB port for firmware updates. When first holding this mod, I was surprised by the excellent build quality. This device is seriously built like a tank, and it is definitely on the heavy side without any battery installed. The version I received does include a Golisi 26650 battery, and I’m pretty sure there is another version that does not include any batteries. Back to the device itself, it is ergonomic and very comfortable to hold. The mixture of silicone, leather, and metal does feel great in the hands. What’s great about it is that it will accommodate all of your larger atomizers, so all of your large 30mm atomizers will sit flush with no overhang! This is a huge pro in my opinion, as larger atomizers are becoming more and more popular in 2017. All of the edges of this device are smooth as well, which adds even more to the comfort. Even though it is on the heavy side, it will still great to hold. The battery door is a screwed cap, which may seem like a con since it does take a little longer to access your battery. However, the threads are beefy and done quite well, so it’s very easy to unscrew and screw the battery cap back into place. There is an o-ring which keeps it completely sealed, which allows for no water to enter. 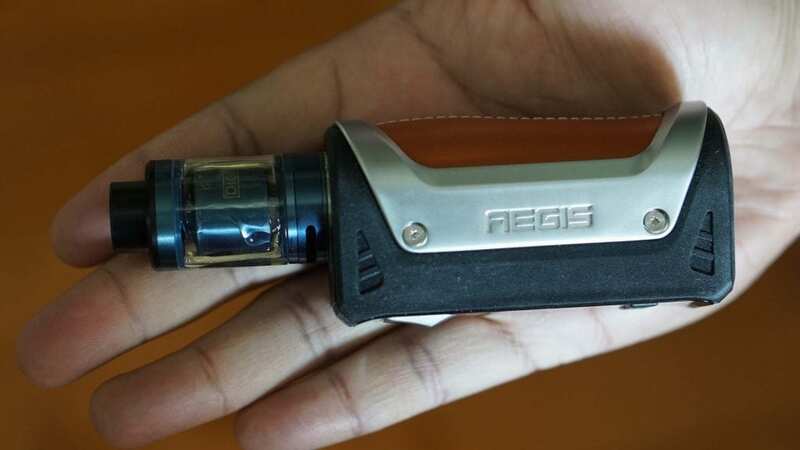 On the metal parts of the device, you’ll notice the Geekvape logo and the name of the device, Aegis. There are zero rattling with this box mod as well, literally none. Also, something I did notice and didn’t think I would like at first is the fire button. It is much different than any other fire button I’ve come across, but after holding this device, it felt comfortable to use right away. When you press the fire button with your thumb, it naturally rests onto the button in just the right place. The fire and wattage buttons are also nice and clicky. Overall, I was very impressed with the build quality of this mod. Even though it was on the heavier side, it was still incredibly comfortable to hold, and there were literally zero cons for me when it comes to the first impression. As mentioned previously in the first impressions, the Geekvape Aegis 100w TC Box Mod requires a single high drain 26650 battery for operation, and you can use an 18650 battery if you desire with the adapter. Included with this version of this device is the Golisi 26650 battery which performed fine. However, I much prefer the IJoy 26650 battery as I got a bit better battery life and just better performance overall. 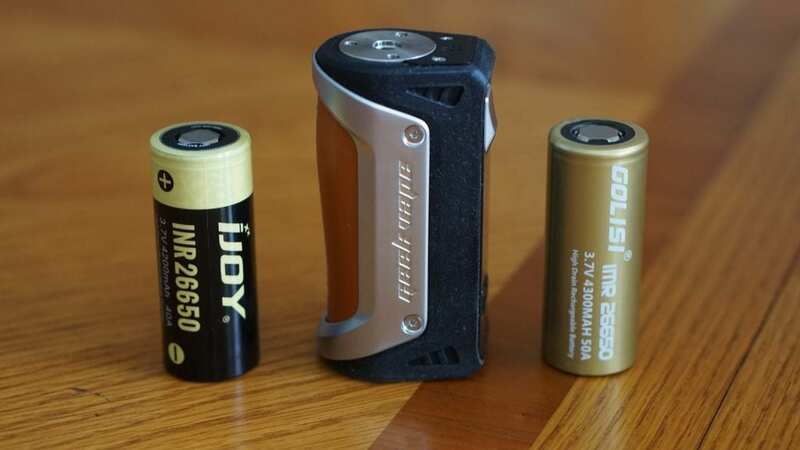 So, I would recommend grabbing one of these IJoy 26650 batteries with this device or any 26650 box mod for the matter. Turning it on is simple, 5 click of the fire button. You can also turn the device completely off by doing the same. Once you turn on the device, you’ll see a lightning bolt flash a few times. Afterwards, you’ll see the base menu screen which shows you the current set wattage, what mode you’re in, coil resistance, amperage, applied voltage, and puff counter. Once you click the fire button 3 times, you can change the settings by utilizing the fire button to scroll down and the wattage buttons to scroll left or right. This device does feature temperature control for Ni200, Ti, and SS alongside a TCR mode. It also features a wattage curve mode and Bypass mode. A nice touch to the temperature control function is that if you choose their standard TC modes such as Stainless Steel, it’ll show you the TCR value they’re using. When you want to exit and get back to vaping, you can simply wait or just hold down the fire button for a few seconds and you’re good to go! The menu system is fairly simple, so I’m sure beginners and advanced users will have little to no issues navigating it. I do want to mention that the screen itself is very easy to see and read, which is a huge pro! I do think it could’ve been a little brighter, but it’s not that big of a deal in my opinion. It is a bit larger than other single battery mods, but not too much larger. It is to be expected since they’ve designed it to be durable. Even though it is a bit larger and heavier, I got used to it fairly quickly. In addition, it is pocket-friendly and you’ll have no issues carrying this mod in a purse. With a single 18650 battery installed it is a bit lighter, but I did prefer to use this device with a 26650 battery for the additional battery life. Also, as mentioned previously, it is very comfortable to hold and use, which is yet again another pro for the Aegis. I did submerge this device in water and it worked just fine right after. I do think that if you left this box mod in water for an extended amount of time it might have issues, but I doubt anyone would leave their device submerged in water for more than a couple of minutes. Also, I did drop it a couple of times to see how it would hold up, and even though it would gain a scratch or dent, it’ll still work perfectly and it held up quite well in comparison to other devices I’ve dropped. All in all, the Geekvape Aegis 100w TC Box Mod was a pleasure to use. Although heavy and larger than most single battery mods, it is still pocket-friendly! Not to mention, it’s incredibly easy to use. 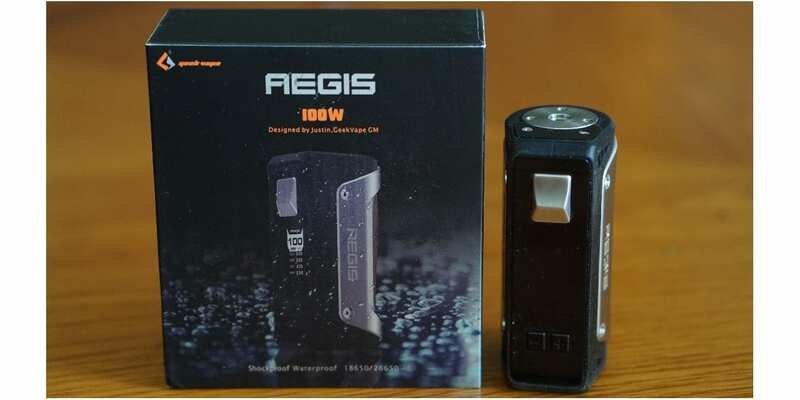 The Geekvape Aegis has a maximum wattage output of 100w. While I don’t have the necessary equipment to test whether or not it’s completely accurate, I can surely say that it does feel quite close to the number. I would typically vape with this device between 45w and 70w, so between those wattages especially, it felt like it was fairly accurate when comparing it to DNA device and using the same atomizer and coil build. If you’re a vaper who enjoys vaping at higher wattages, then this device may not be for you since it’s capped to only 100w. Honestly, this is plenty of power for a lot of vapers, and since I do primarily vape under 100w, it wasn’t an issue for me. Regardless, it’s still something to mention and keep in mind if you’re interested in purchasing this device. The maximum voltage output if 9v, which is great especially for you vapers who prefer to vape higher resistance coil builds. In addition, the temperature control worked pretty great as well. Since you can adjust the TCR to your liking, you can easily fine tune it to your preferred wire material. I did test the Stainless Steel temperature control mode only as I rarely ever vape on Ni200 or Ti wire, and it was an enjoyable vape experience. As soon as you hit the fire button, it fires immediately without any delay. It does fire quite quickly as well, and I was impressed by this. This is huge pro as many vapers including myself just hate when a device has a delay when you hit the fire button when vaping. The battery life is pretty good with this device as well, especially if you’re using a 26650 battery like the IJoy battery mentioned previously. 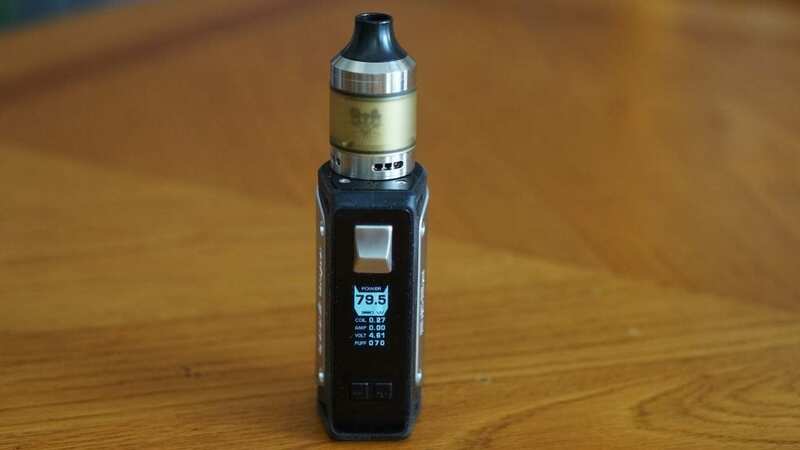 If you are vaping at higher wattages such as 80w and above, don’t expect all day battery life. However, when vaping at 45w to 60w, I can easily get almost a full day of battery life. All in all, the performance was solid. I had zero issues with this device when it came to performance! In conclusion, the Geekvape Aegis 100w TC Box Mod is a well built device with tons of features, and is very easy to use. I was honestly surprised with it’s excellent performance and solid design. The Aegis has easily become one of my favorite, if not my favorite single 26650 box mod. Even though there were some cons mentioned, all of them are subjective. Like mentioned earlier, even though it is a bit heavier and larger, it still is extremely comfortable to use and is still pocket friendly. There are no sharp edges, and it just feels great in the hands. In addition, I got used to its weight and size quickly, so this wasn’t an issue for me. I’m still not a big fan of the screwed battery cap, but it was necessary to have it due to its waterproof and shockproof design. All in all, if you’re looking for a well made single 26650 device or want a box mod that can withstand a beating due to your work environment, then I can highly recommend the Geekvape Aegis 100w TC Box Mod!